Richmond Hill is home to a lot of small businesses that reflect the town’s unique character. Of course, just because many of the businesses here are small doesn’t mean they can’t have well-designed, visually-appealing offices. 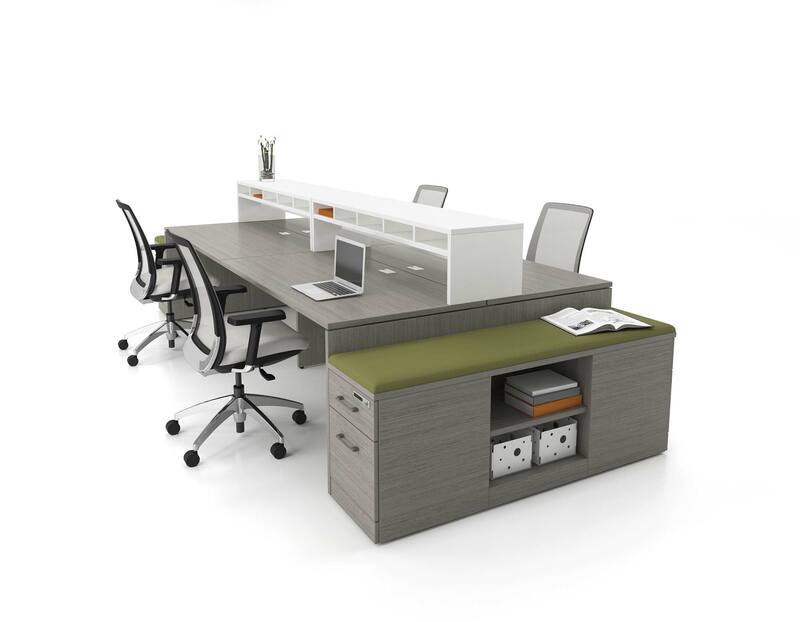 Alliance Interiors wants to keep your Richmond Hill office looking great and running smoothly. We’re more than just an interior design firm—we look for affordable design solutions that can help you meet your business goals, whether that involves procuring ergonomic chairs to improve employee morale, renovating your entire office to provide clients with a modern experience, or anything in between. We’re all about business environments that make sense and meet each individual client’s needs. Reduce employee absenteeism and turnover, since an optimized office layout means happier and healthier employees. Improve communication between team members by establishing a more collaborative work environment. Cut down on the kinds of excess noise and distractions that may be preventing employees from staying focused and being their most productive. Stay more comfortable and prevent injuries, thanks to ergonomic furniture, when you have to work at your desk for long stretches of time. Make the most of a small space and streamline daily operations. Stay organized with creative storage solutions. Show off the best side of your business to clients, customers, and anyone else who visits your office. Attract high quality job candidates. Make employees proud to call your office their workplace. Corporate Interior Design. We listen to our clients’ specific needs and then help plan a remodel that will meet those needs while looking great and staying within the established budget. Corporate Office Relocation. Don’t stress about your business’s big move to another suite or building. Let Alliance Interiors save you headaches by working with movers to make your transition as seamless as possible. And, of course, we’d be glad to help you come up with the ideal layout for your new space. Home Office Set Up and Design. You don’t need to have a big space to benefit from Alliance Interiors’ services. We have experience helping solo entrepreneurs set up professional workspaces within their own homes. We look for common in-home office problems, like distractions from other parts of the house, and address those problems with creative design solutions. Layout and Space Planning. Perhaps one of the most essential ingredients of a productive work environment is a good layout. Alliance Interiors can help you determine how best to arrange employees, workstations, and other office elements to improve communication and maximize efficiency. Project Management. You can contact Alliance Interiors even if you just know you want to make some changes but aren’t sure what to do yet. We’ll meet with you to discuss your goals, budget, and timeline in order to come up with a project plan that works for you. Furniture Procurement. Find ergonomic seating, environmentally-friendly window shades and more with the help of Alliance Interiors. We work closely with top Canadian furniture providers to ensure that you get a good deal and receive your new orders promptly. Artopex: Discover a wide range of storage solutions, workstations and more that will not only help you stay organized, but will reflect the style of your office and brand. Art Design International (ADI): Get office chairs that are specifically designed for individual comfort, increasing employee productivity, and improving long-term worker well-being. Humanscale: Known for their award-winning ergonomic task seating, Humanscale provides highly adjustable products to improve comfort and well-being for those who work at desks for long periods of time during the work week. Allseating: As the name suggests, Allseating is another vendor that focuses on high-quality office seating. They provide stools, computer chairs and more to customers in the office, educational, and health care sectors. SunProject: Look no further for energy-saving and attractive window coverings. SunProject’s Solar Shading solutions work with both high-end interiors and technically demanding exteriors. ISE: Turn to ISE for an extensive range of innovative office furniture solutions, including adjustable height desks, personal lighting, work station foot rests, and mobile tables. Don’t just keep wondering how a remodel or other interior design changes could improve your office. Find out for yourself by contacting Alliance Interiors. We’d love to hear from you, whether you’re ready to improve your office space now or you’d just like to learn more about our services and business philosophy. If you do decide to work with us, we’ll arrange an initial consultation that works with your schedule and make sure your interior design project gets underway as soon as possible. We’ll also work with you to establish a budget so that we can find the best design solutions while staying within your price range. We look forward to helping your Richmond Hill business reach its full potential.